"Brook Anspach Willing, Westbrook College, 1977"
Westbrook College student Brook Anspach Willing, Class of 1977, was a Recreational Leadership major and a Day Hop. 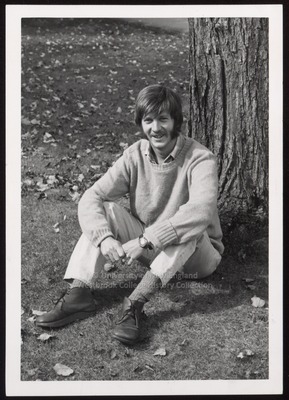 For his senior class candid photo, which appeared in the 1977 Tower Yearbook, he wore light colored pants with a pale crew neck sweater and plaid shirt collar just visible at the neck. His hair was parted on the side and ran into his muttom-chop sideburns. Brook sits on the ground at the base of a tree on the Campus Green.